Perhaps one of the more common designs is the rose tattoo. Famous for being an ornamental plant, the rose is commonly seen in beautiful gardens. Because of their attractive foliage, they have been cultivated since ancient China and Persia. Aside from their ornamental use, roses are widely cultivated for their fragrance. In the Victorian period, roses and various flowers were used in the homes for their pleasing fragrance. There are various meanings associated with this flower. For instance, their scent is thought be lavish and powerful. This is one of the reasons why many choose to have rose tattoos. Being associated with romance, rose tattoo designs are perfect for romantic and passionate people. Cleopatra was known for her lavish perfumes and was aware of the power of scent. She supposedly filled a room filled with rose petals while wooing Marc Anthony. Love and sensuality were perhaps the most common meanings associated with roses. On the other hand, a rose tattoo with thorns can mean love and sacrifice. The thorns of a rose can also represent masculinity and so many men with rose tattoos have thorns incorporated in the design. 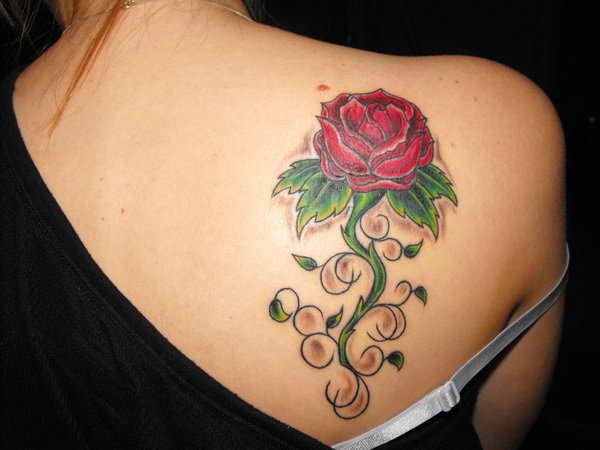 Women often choose to have rose tattoo designs because of their innate beauty. It can symbolize the goddess from within. For many Christians, a rose tattoo can symbolize purity, perfection, and sacrifice. In church symbolism, a white rose is equated with purification while a red rose serves as a memorial to the blood of Christ. A yellow rose tattoo can represent jealousy, pink rose means happiness and grace, orange roses indicate desire, lavender roses are meant to express feelings of love at first sight. Thus, although the meaning of rose tattoo designs may seem evident, they can symbolize a lot of things depending on their color, style, and placement. Because you can create any meaning you want with rose tattoos, you are not limited to traditional meanings and thus gives you more freedom in the design.